We thought about what we want, as riders, when we’re shopping for saddle pads and then we brought it to life: outstanding quality, classic styling, and unbeatable prices. 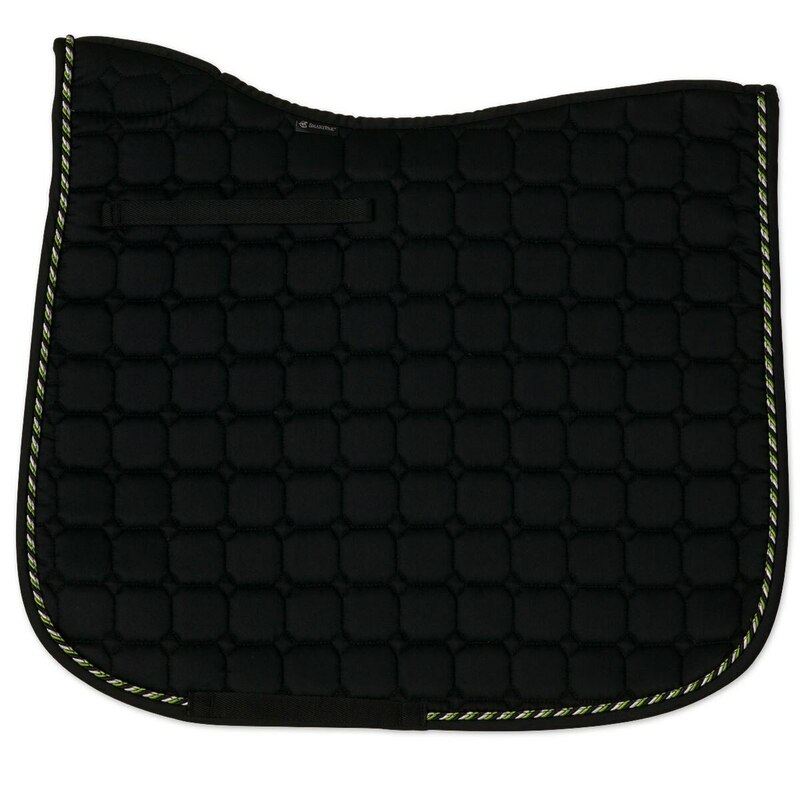 This pad is lightweight and breathable to keep your horse cool and dry. 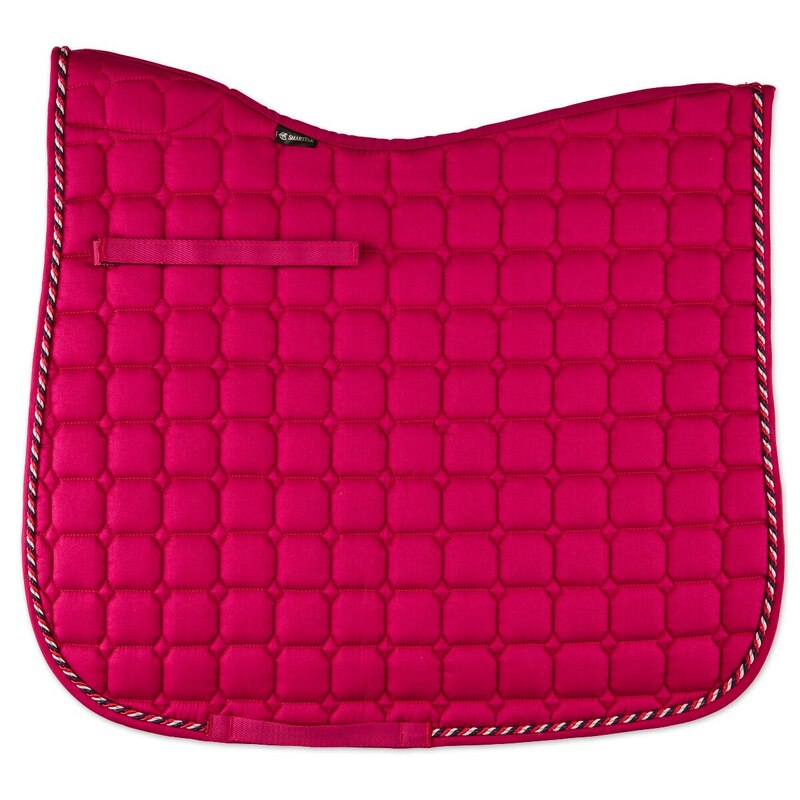 It also has a special cut and padding designed to provide wither relief as well as soft quilting and plenty of cushion to keep your horse comfortable. Designed to fit most dressage saddles, this pad has sturdy billet and girth straps to help keep your saddle in place while you ride. Plus, it’s available in a variety of traditional and fun colors and easy to customize with a monogram, name, or barn logo to match your style. Finally, this pad features a diamond and octagon quilting pattern and a stylish tri-color twisted rope trim for a fun touch. This is the perfect schooling pad! 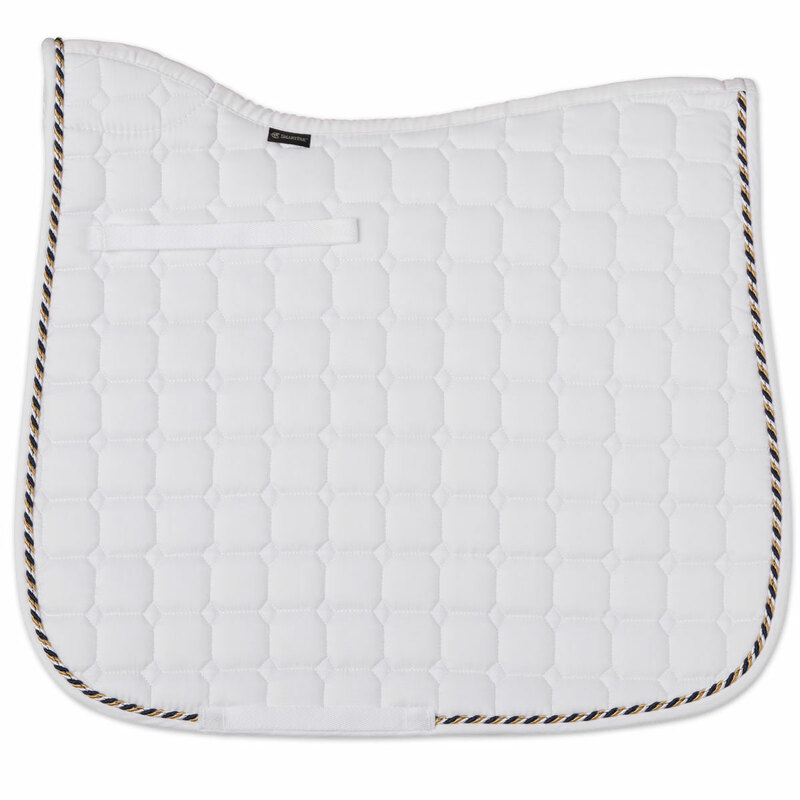 SmartPak Octagon & Diamond Deluxe Dressage Saddle Pad is rated 4.5 out of 5 by 34. Rated 5 out of 5 by Emilyequestrian from Wonderful saddle pad I bought this pad a month ago and it has help up tremendously! The fabric is very durable but also soft and comfortable for your horse. 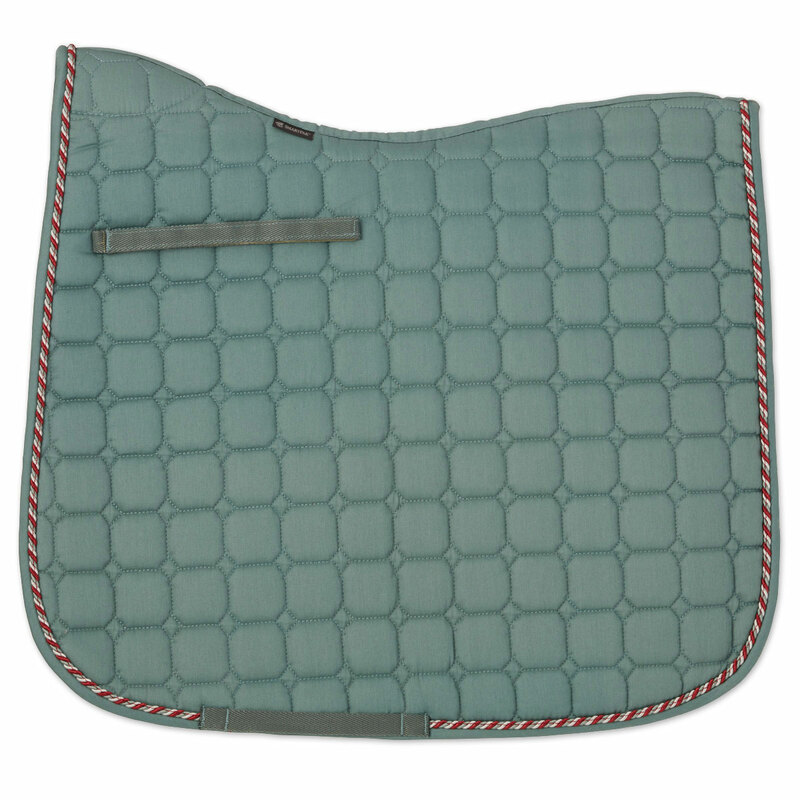 I approve this saddle pad for sure! Rated 4 out of 5 by CiscoKid from Nice saddle pad... This is a very nice pad for the price. Could still be 2 to 3 inches longer in drop and spine. Rated 4 out of 5 by zazurka from NICE PAD FOR THE PRICE I like this pad, it is soft and very vibrant color. I got the blue one and received several compliments on it. I like size of it as I have 17.1 tall horse and need 24 inch pads for him. I have only used it few times so I cannot rate on durability yet. Rated 4 out of 5 by Variety Pack from Good spine length for Mattis pad I have not had a chance to use pad yet although sale price and free embroidery.. what's not to like? Rated 5 out of 5 by Prettyfilly from Big and Beautiful This is a great saddle pad that has the looks that gets compliments. It's spine and drop are large enough for a 17.5" saddle, which is sometimes hard to find. I love the wither relief too. I haven't washed it yet so don't know how it will hold up but so far, no complaints. Rated 5 out of 5 by Katie42 from perfect fit I bought this for my 19 year old TB. He has extremely high withers. This pad offers a wonderful fit so that my mattes pad can fit the way it needs to. I only gave 4 stars for durability because I haven't had it long enough to know for sure. Rated 5 out of 5 by Bmac from Great Value! I was given this pad by a friend who didn't like the fit for her horse. It worked really well for my WB with large withers and I really like the thickness, color, and padding in the wither area. For reference, my saddle is 17" with an extra short flap. Rated 5 out of 5 by DEBBY from Can't say enough good things! Pad is perfect! Not too thick but not flimsy either! Rated 5 out of 5 by Kittcatt678 from Gray is gray Nice looking and serves its purpose. The gray is actually gray not beige as it looks online which is what I was wanting.